Gold Bond Extra Strength Medicated Body Powder 4oz has been formulated to help you with any skin ailment you may have. Designed to support multiple kinds of skin ailments, Gold Bond skin care products can aid you with repairing, moisturizing, and calming your skin. ADW Diabetes offers a wide selection of Gold Bond skin creams, powders, and lotions in both single units and discounted bulk packs for your convenience. 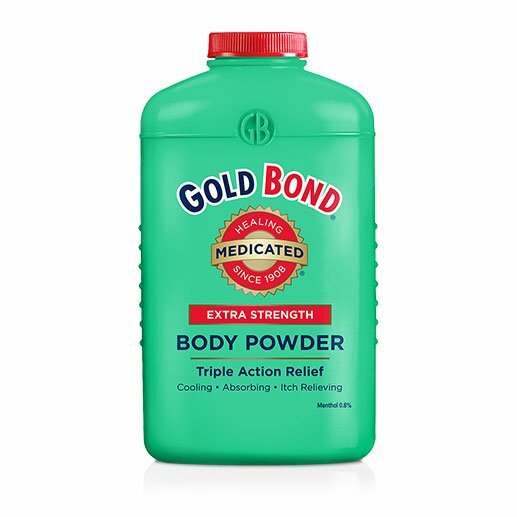 Gold Bond Extra Strength Medicated Body Powder 4oz features a blend of two medically proven ingredients combined with the finest powder and essential oils, but it's got five times more medicine and delivers an even more potent cooling kick. With extra moisture absorption, extra cooling powder and extra itch relief, Gold Bond's Extra Strength formula is a medicated body powder that works hard in relieving skin discomforts, yet it's gentle enough to use every day. After shower, bath or exercise, simply apply this powder for lasting deodarant protection and that cool, refereshing feeling. This stuff does what it says: Cools. Absorbs. Relieves. Works..
Zinc Oxide 5% / Skin Protectant. Symptoms do not get better within 7 days or clear up and occur again within a few days.